There’s something about Quality Street that just says Christmas, isn’t there? 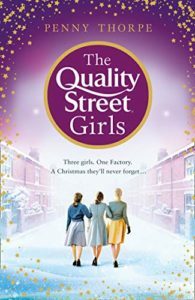 So I’m pleased to be reviewing The Quality Street Girls by Penny Thorpe today. My thanks to the publishers, Harper Collins, for the review copy via Netgalley. A seasonal delight, inspired by the true story of the Quality Street factory. At sixteen years old, Irene ‘Reenie’ Calder is leaving school with little in the way of qualifications. She is delighted to land a seasonal job at Mackintosh’s Quality Street factory. Reenie feels like a kid let loose in a sweet shop, but trouble seems to follow her around and it isn’t long before she falls foul of the strict rules. Diana Moore runs the Toffee Penny line and has worked hard to secure her position. Beautiful and smart, the other girls in the factory are in awe of her, but Diana has a dark secret which if exposed, could cost her not only her job at the factory but her reputation as well. I just couldn’t resist a book about the factory where they made Quality Street for the first time in the 1930s. There’s just something about those brightly coloured, cellophane wrapped sweets (I’ll fight you for the strawberry creams!). This is the story of four of the girls who worked on the lines at the Mackintosh factory in Halifax. Reenie was my absolute favourite. I loved her. Just about to turn 16 when the book begins, her dream is to work at the factory so when she gets a job there her dream comes true. She’s one of those naively honest characters who just says what she thinks without thought for the consequences, but it’s never in a nasty way. She just wants to help. Then there’s Diana, a slightly older girl who has built up a wall around herself to protect herself and those she most cares about. I liked Diana very much too as she’s strong and resourceful. Finally, there are sisters, Mary and Bess. Mary is a bit sour at times and spends a lot of time covering up for her sister who is a bit airy-fairy. But again, they are immensely likeable characters. Put them all together and you have a really good story. I absolutely loved the descriptions of the sweets, the machines and the way the factory worked back then. Some of it was mechanised but some wasn’t and so it had to be done by hand at piece work rates. It wasn’t hard to imagine the smell of those strawberry creams and I particularly liked it when one of the girls fainted and no smelling salts were to hand to bring her round. It was suggested that she be taken to the mint cracknel room because the mint oil was so strong it would do the trick. What an experience working there must have been and there’s a real sense that it was a fabulous place of employment. I know it’s fiction but the author clearly has a lot of knowledge about the factory and has done her research. As you might expect, the characters go on many ups and downs before the end of the story, but it’s a very heart-warming story as they all look out for each other. I really enjoyed this Christmassy chocolaty story. I had a strong sense of how different times were then. Now we just go to the supermarket and buy ourselves a tin of Quality Street. Then, just one sweet or toffee was a real treat. Just like this story. Penny Thorpe lives in Yorkshire where she has been the company archivist and historian for her local chocolate factory for more than a decade. She’s worked in libraries, bookshops, offices, a Swiss school, a racecourse, a barber’s shop, a church, and a police station (to name but a few). Penny is a recognised expert in her field, but still isn’t quite sure how that happened. She has written about the history of confectionery for years and regularly appears on television and radio to talk about the history of Yorkshire, chocolate, coffee, Quakers and food.